We are now accepting applications from potential sponsors, vendors, installation artists, volunteers, and reading hosts for 2019’s New York City Poetry Festival! Every year on the last weekend of July, The New York City Poetry Festival invites poetry organizations and collectives of all shapes and sizes to bring their unique formats, aesthetics, and personalities to the festival grounds, which are ringed with a collection of beautiful Victorian houses and tucked beneath the wide, green canopies of dozens of century old trees. By uniting the largest community of poets in the country and offering a unique setting for literary activity, the New York City Poetry Festival electrifies arts and literature and brings poetry to new light in the public eye. The Governors Island Ferries from Manhattan and Brooklyn are both operated by Governors Island and are designed specifically for visiting the island. They take direct routes to and from the island without stops. You can find the complete, up-to-date ferry schedules for each location on the Governors Island website. The Governors Island Manhattan Ferry departs from the Battery Maritime Building at 10 South Street, New York, NY. The Ferry landing is immediately east of the Staten Island Ferry (but not the same building). It is at the very southern tip of Manhattan and easily accessible from the 1,4,5,N,R,J or Z trains. The Brooklyn Ferry disembarks from Pier 6 in Brooklyn Bridge Park, located at the foot of Atlantic Avenue (corner of Columbia Street). It is accessible via the R,2,3,4,5 trains and the B23, B65, B61 buses. The East River Ferry, operated by NYC Ferry, makes several stops along the East River—Midtown, Long Island City, Williamsburg, Dumbo, Wall Street—and only stops at Governors Island on weekends. A complete, up-to-date ferry schedule listing the locations of all stops is available on the NYC Ferry website. 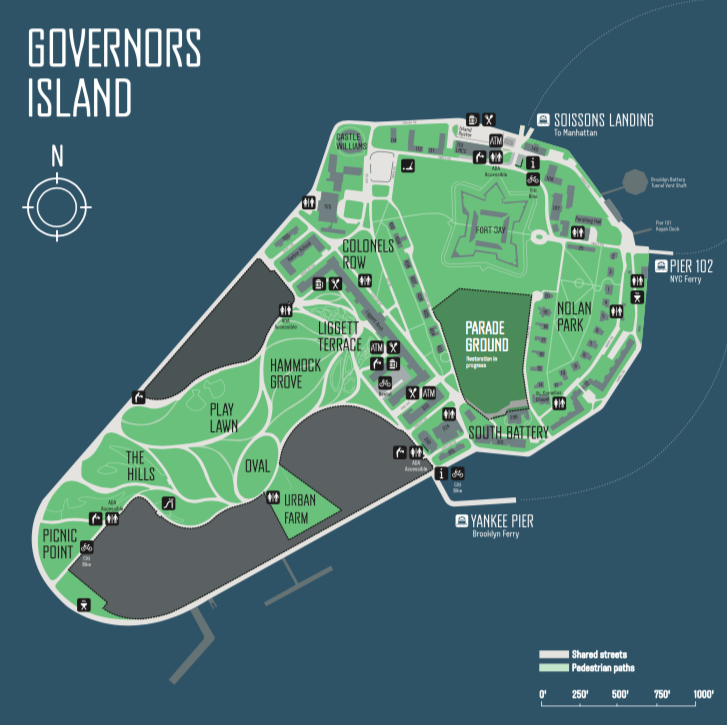 Here is a link to a downloadable PDF map of Governors Island that shows you the walking routes from each of the ferry landings on the island to Colonel's Row.